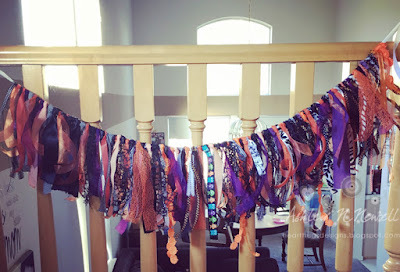 AshleyNewell.me: Will You Help Me Make a New Ribbon Banner? Will You Help Me Make a New Ribbon Banner? Hi friends! I hope you are well! Sigh... I fell off the blogging wagon. This weekend was rough both with all that's happening in this world and personally. I just didn't feel like blogging so I didn't force it. Last month when I was making my Halloween ribbon banner, I had a fun thought. What if I could make a ribbon banner with a bunch of pics of ribbon from my friends? I'm hoping to get 12 inch pieces of ribbon from a bunch of friends. I was thinking my friends could write their names on the ribbons with Sharpie. This way, I will have a decoration that I can pull out every year and it will have such an amazing meaning. Please email me or message me on Facebook if you'd be willing to send me a ribbon for my banner. I have tons of ribbon, just no ribbon that has any meaning behind it. Have a great day, friends!